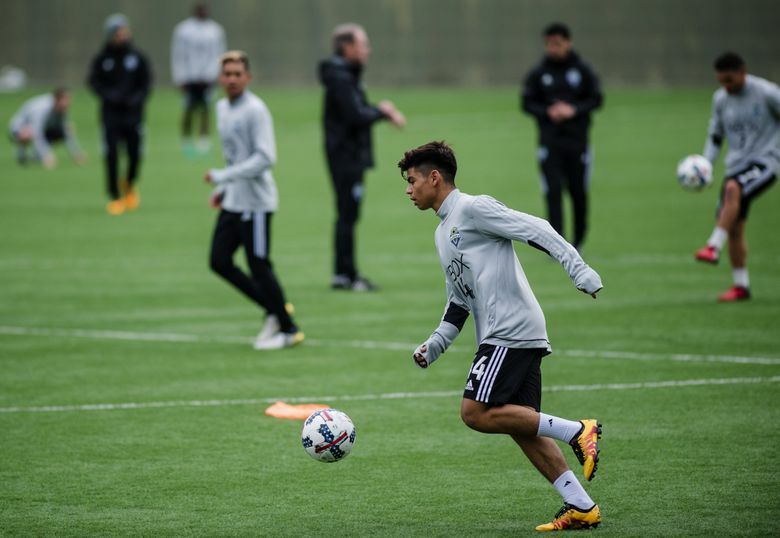 It’s rare in team sports to see a player as young as 15-year-old Azriel Gonzalez dressing and working out alongside professionals at the highest level. But the Sounders have invited four of their top youth academy players to join the MLS squad for its training camp. F or Azriel Gonzalez, it was as if his video games had come to life. At age 15, the closest he’d gotten to Clint Dempsey and the Sounders had been through the EA Sports FIFA soccer video game. But then, this week, he found himself inside a locker room in Tukwila suiting up alongside one of the more decorated American players in history. Dempsey spotted a quiet Gonzalez hunched in a corner trying to act invisible. That’s when the former U.S. national team captain walked over and asked him how he was. Gonzalez admits meeting players he’d been used to playing in video games had left him somewhat starstruck. It’s rare in team sports to see a player as young as Gonzalez dressing and working out alongside professionals at the highest level. But the Sounders, for the first time this winter, have invited four of their top youth academy players to join the Major League Soccer squad for its training camp and for some, its upcoming exhibition games. Gonzalez, a forward, joins Sam Fowler, 16, Seattle native Sam Rodgers, 17, and Shandon Hoppeau, 18, in camp. There are also a couple of academy prospects now with the under-18 national squad that may join the Sounders in Tucson, Ariz. next week for their exhibition season launch. The team sees the inclusions as a sign its youth movement is talented enough to actually push the older players in workouts. Also, the Sounders feel giving teen prospects a taste of the pro ranks this early can breed good habits. “Seeing them in the locker room, seeing how they live their life, it just made me want to became a pro even more,” said Gonzalez, who will continue training with the team in Tucson. He’s most impressed with their attention to diet, how they work out and stay late after practice. Instead of grabbing a piece of chocolate, he says, he’ll now eat a salad to curb hunger. Building youth academies is fundamental to any MLS team seeking success. For the MLS Cup champion Sounders, having produced DeAndre Yedlin and Jordan Morris, among others, the results have spoken. Selling Yedlin’s rights to the Tottenham Hotspur of the English Premier League in 2014 netted the Sounders 75 percent of a reported $4 million transfer fee. The Sounders then received an additional $600,000 via a “transfer on” fee last year when Yedlin, raised in Shoreline, was sold by Tottenham to Newcastle United. That kind of cash pays for several free agents on this side of the globe to keep an MLS team strong. Then, there’s Mercer Island native Morris, last season’s MLS Rookie of the Year. All Morris did was help lead the Sounders to their first championship last month in Toronto. Not to mention, growing a talent like Yedlin or Morris is a lot cheaper than shopping for one elsewhere. That’s not as easy as it sounds. You can’t just let 15-year-olds run wild with pro athletes. Nicholls is part director, part minder for the brightest talent among the team’s Under-16s. Pro athletes are mature adults. They lift weights daily. Gonzalez can’t do that yet and at 5-foot-9, 148 pounds is at a serious physical disadvantage out on the pitch. One thing Gonzalez does best for his academy team is finish off scoring opportunities, something he’ll be limited in doing here against seasoned pros. But just stepping out alongside players he admittedly plays in his FIFA video game sessions – sometimes during the evening after working out alongside them in Tukwila – is something he’ll carry forward. As will his family. It took great sacrifice to get Gonzalez here from his native Las Vegas. 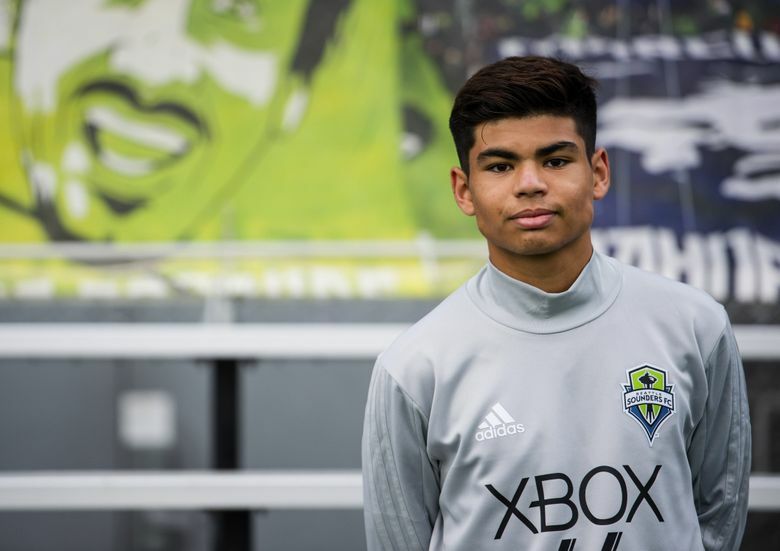 He joined the Sounders academy at their invitation at age 13, spending the first year living with a cousin in Renton. His mother, two brothers and a sister eventually joined him here, while his father stayed back in Las Vegas trying to sell the family home. His father says he saw his family only four or five times all of last year. He was paying rent on a property in Kent and the mortgage on the Las Vegas home and had to work overtime at his construction job just to balance things out. It wasn’t until December, having sold the home and bought another one here in Renton, that Gonzalez’s dad finally joined the family full-time. At 8:30 a.m. daily, he’ll make the five-minute drive from their home to the team’s Starfire Sports Complex to drop his son off. “Sometimes, I’ll stay and watch the practice,” he said. But not all the time. He has to find construction jobs here to keep the family fed. Sometimes, he’ll pick his son up after workouts, or his wife, Sandra, does it. She was opposed to Gonzalez initially coming here, knowing the family would be separated. But Gonzalez and his dad, who played soccer intensively at school in his native Nayarit, Mexico, worked on her and she finally relented. Still, it was hard on the family. But the family knew this type of soccer exposure doesn’t come around often. And that even though academy players aren’t paid – they’d lose college eligibility if they were – the real payoff is potentially down the road. Even as a 10th grader, Gonzalez understands what his family has given up and isn’t about to throw it away. He’ll head home from the Tukwila workouts in the early afternoon and spend four hours daily doing home schooling. After that, he’ll nap for an hour, eat, and then play video soccer, watch TV or do extra school work before going to sleep by 9:30 or 10:30 p.m.
His friends, mostly from the academy but also some from the neighborhood, do visit to hang out – but mostly on weekends. The academy friends wish him luck and remind him he’s “lucky” to be hanging out in the plush locker room with the first-team stars. Gonzalez isn’t famous yet. But the taste so far is enough to whet his appetite for more. The Sounders took steps Monday to shore up their midfield by signing Swedish midfielder Gustav Svensson, 29, to a two-year deal. Svensson comes over from Guangzhou R&F of the Chinese Super League and provides the Sounders some veteran presence up the middle following the departure of Erik Friberg and continued health uncertainty surrounding Osvaldo Alonso and Clint Dempsey. Sounders general manager Garth Lagerwey said the Guangzhou club picked up most of Svensson’s salary. Recent roster rule changes in China now limit teams to carrying only three foreign import players instead of four, causing some to have to scramble to offload non-Chinese players at bargain rates. The Sounders already had a potent midfield duo in Alonso and Cristian Roldan. But Alonso is still recovering from strained knee ligaments left over from last year’s MLS Cup run and the team wants to go slowly with him for now. Svensson, a 10-year-pro with stops in Sweden, Turkey and the Ukraine prior to his stint in China, could push the pair for starting time, while playing a featured role off the bench. Lagerwey says the Sounders, who have gone younger this offseason, hope to benefit by adding a veteran. “We added another adult to our group,” he said. The 6-foot, 155-pounder missed only two matches for Guangzhou last year. Svensson began working out with the Sounders on Monday in Tucson.